In the first leg of what was the most exciting prospects from the selection of CL matches a great game was expected, yet not primarily in the players on show but the tactical ability of the two managers who are, especially in the case of El Cholo, regarded amongst the best in the world. The most notable feature of either side is the intensity in their play, most particularly in Schmidt’s Leverkusen who have become renowned for their unique pressing game which has been developed. Schmidt’s side lined up in their usual 4-2-3-1 shape with a back four of Wendell, Papadopolous, Spahic and Hilbert protecting the impressive Bernd Leno in net. Ahead of them sat Castro and Bender, the former in particular had a strong game for Bayer acting in an important role for their possession game. Eventual goalscorer Hakan Calhanoglu was the key player in the middle of the three, flanked by Heung-Min Son on the left and Bellarabi on the right, both of which often made inside movements. Drmic was chosen in favour of Stefan Kiessling up front. For the away side, Simeone pulled a slight surprise in his selection of a 4-5-1. A fairly standard back 4 was a head of Moya in goal, featuring Miranda and Godín as the centre-back partnership with Siqueira defending the left flank and Juan Francisco on the right. Tiago was the central midfielder and was the deepest mainly, though his situational orientation on Calhanoglu meant that it was often flat. On the left, Saul was the 8 supporting Griezmann at left wing, whilst Gabi supported Arda Turan on the right. Mandzukic was the lone striker up front. Atletico lined up in a 4-1-4-1/4-5-1 formation which was one of the main surprises in the build-up. Although the 4-5-1 is common to Simeone’s side, it is certainly their secondary formation to the 4-4-2(-0) and is often used for in-game changes and not as the starting shape. I think the reasoning for this was almost entirely in reaction to their unique opposition. Theoretically, a 4-5-1 would support their central control in possession against Bayer’s pressing. When they change to a 4-5-1, the extra midfielder allows for greater combination play to break through the centre of the pitch, especially when the wide players are inside the half-spaces. In addition, it decreased Bayer’s ability to utilise counterpressing as an attacking tool. Although this has been less so in comparison to Schmidt’s Salzburg, situationally they can use vertical passes to densely populated areas of the pitch when the possibility of success isn’t great, but hope to at the least regain possession immediately through counterpressing. This will leave the opposition temporarily disorganised as they react to regaining possession, allowing for more incisive attacks. The 1-2 central players matched Leverkusen’s 2-1 also, meaning that man-orientations could be used, especially against Calhanoglu. Although this area of the game didn’t cause Simeone major issues, the strategy was disrupted partly through nice inside movements by Bellarabi and Son, whilst the excellent Calhanoglu moved deeper situationally (during moments where Bayer lacked penetration). One could consider Atleti’s 4-4-2 as a 4-4-2-0 in reality, as the strikers become so deep, however the 4-5-1 provides greater stability without regards to graduations which are near impossible, especially in transitions. 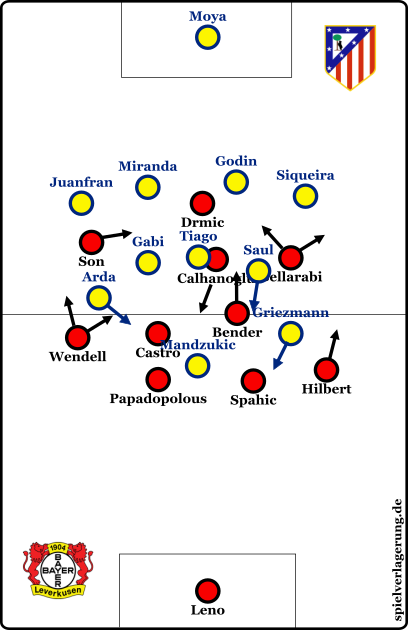 In Bayer’s 1st phase, Atleti could often be considered a 4-4-2 at times, as Griezmann or an 8 often supported Mandzukic in blocking passes into midfield, whilst one of Saul or Gabi situationally (usually in deeper Bayer possession) was oriented onto the Leverkusen 6s. A very nice feature of Bayer’s defensive game was their, as ever, excellent counterpressing. Although they didn’t have an as big of an emphasis, the immediate pressure from the ‘3+1’ was a constant during the match, especially given the narrow nature following Bellarabi and Son’s inside movements in possession. This resulted in Atletico having issues in their development of possession and struggled to form counters in transition. Interestingly, they faced similar issues in the previous week in the 2-0 loss to Celta Vigo which will have been encouraging for Schmidt in preparation, as his Bayer side are amongst the best in the world in this aspect despite his short tenure of half a season. Leverkusen were particularly intense in pressing and compactaction on the right where one of the best Rojiblanco players, Arda, was positioned. This resulted in him having a lesser effect on the game as passing options inside were covered whilst Leverkusen’s numerical superiority in these areas meant forming connections to support the isolated Arda was near-impossible. 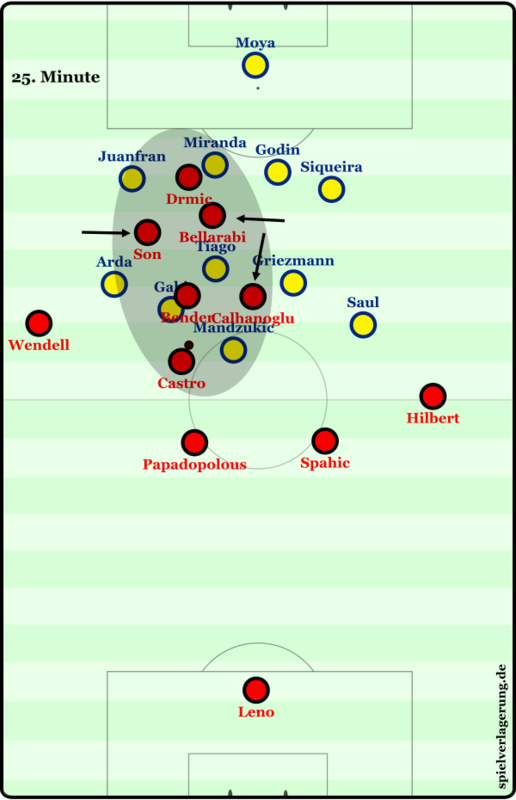 With both teams compact, the possession game for either side was made quite difficult, yet this was probably less so for the home side, as Atleti’s low block was less disrupting as Leverkusen’s intense defense higher up the pitch. For the final 10 minutes of the first half, Simeone inverted the triangle to create a 4-4-1-1, with Griezmann central and Raul Garcia moving to the flank. The result was quite immediate as Atleti created some good chances, one in particular forcing a great save from Bernd Leno. This was a stark contrast to the first third of the game where the home side were on top going forward. The main result of this was that it allowed Griezmann to have a much better influence in the game. Where he wasn’t influential on the left wing, the Frenchman was much more threatening down the middle where he was performed excellently in recent weeks. With this shape, Mandzukic was supported more in possession and could work better in the central partnership, whereas in the 4-1-4-1 the distances between the Croat and wide players was just too great. In addition, Griezmann could theoretically support against the Bayer counterpressing better, through supporting Mandzukic on long balls. A striking difference between Schmidt’s Salzburg and Leverkusen, is that the latter’s possession game is much better developed. This showed today as they looked more comfortable against the compact low-block of Atleti, and moved the ball well in deeper areas instead of resorting to a long ball game. This was supported greatly by Gonzalo Castro whose role saw him having a considerable influence in the 1st and 2nd phases whilst Bender moved higher up past the first line of pressure. Although they played at a slower tempo than what we expect of any team coached by Roger Schmidt, when they increased the tempo, their combination plays were much more effective. With Son, Bellarabi and Calhanoglu often narrow together with the support of an advanced Bender and situationally Castro, they moved the ball quickly, especially when Atleti offered space in their press. The movement of the 3 was key as ever, allowing them to generate overloads in most areas of the pitch – Bellarabi in particular moved towards the left flank to support developments down that side. This was evident in the below diagram, where the movements facilitated a numerical overload for Castro, the deepest player to utilise. Following the red card of Tiago, Atleti changed to a 4-4-1 with Torres at right midfield leaving Mandzukic upfront. The interesting aspect in this though was the reaction, or lack of, from Bayer. Their ball circulation and positioning became less attacking against 10 men, suggesting that they decided to settle for a draw which is, in my opinion, debatable at the least given Atletico’s great record at the Calderon. It may have been a better decision to become more expansive in the search of a 2nd goal, especially with Atleti displaying an inability to initiate attacks in transition when faced with counterpressing. 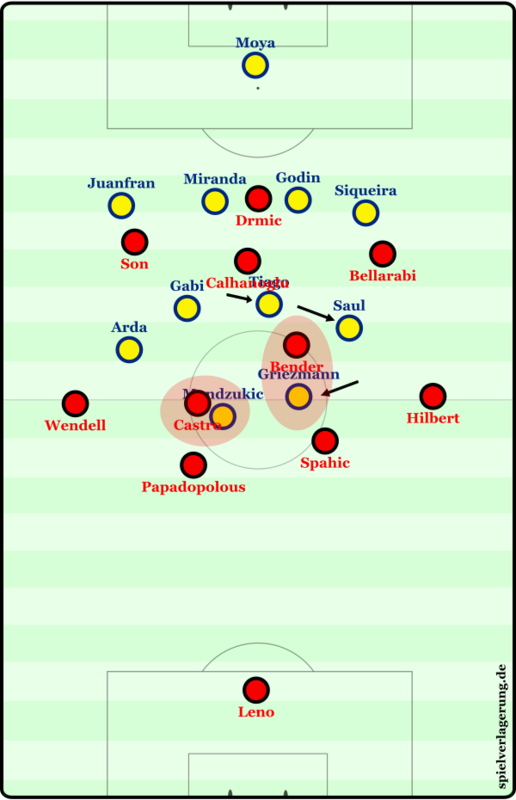 What precautions Simeone had made with 11 men to try and stop Bayer from capitalising centrally, were now lost somewhat as they didn’t have a third central midfielder whilst a tiring Mandzukic was the one player to block passes from the 6, compared to the usual two strikers in the 4-4-2-0. In summary, it was an interesting tactical battle as expected and a better game than the scoreline suggests, the clash between two great and unique managers was central to it all. The return fixture may prove to be even greater, as a 1-0 lead is still dangerous to take to the Calderon, whilst Simeone must be more proactive to turn the tie around and will probably change the starting system after witnessing the 4-5-1 struggle in Germany. As you say this was one of the few games that we looked forward to due to the guys in the dugout rather than those on the pitch. Two intense teams and actually quite a good match. Tough one to predict for the 2nd leg, no doubt Atleti can win 2-0 but Leverkusen are excellent in transitions and could easily grab a goal that way I think it will be 1-1 or 2-1 to Atletico with Leverkusen going through.